Muffins are delicious and donuts are delicious. Muffins that taste like donuts are even better! Try out theses Old Fashioned Donut Muffins and I’m sure you will not be disappointed. Preheat oven to 425°F and lightly grease a muffin tin. In a large bowl, whisk together butter, oil, sugar and brown sugar. Add eggs, whisk to combine. Stir in baking powder, baking soda, nutmeg, cinnamon, salt and vanilla until combined. Stir in the flour and milk, alternating between the two until fully incorporated. Divide the batter between the 12 muffin cups. Bake until light brown and when a toothpick inserted in the center comes out clean. About 15-17 minutes. Prepare the glaze by mixing melted butter, powdered sugar, vanilla and hot water together in a small bowl. 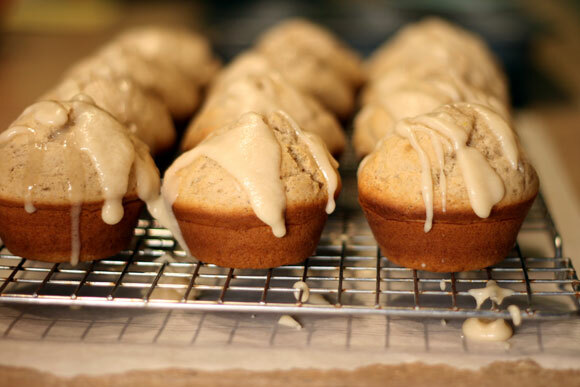 Place muffins on a cooling rack with a sheet of parchment paper under it. Drizzle with the glaze.